If you’re looking for a clutch inspection or clutch replacement, NorAm Auto Repair Services is your clutch expert. I use quality clutch parts that are made to last; these parts meet the original specifications of the clutch installed at the factory when your car was new. As a part of your car’s clutch replacement, I will install a new clutch disc, pressure plate, throwout, and pilot bearings. Your existing flywheel will be reground, or, if necessary, replaced. The clutch cables or hydraulics will be examined for full functionality, transmission and motor mounts will be examined, and in most cases your transmission oil will be changed. Symptom: The engine is working hard or revving going uphill or on a flat street. Cause: This is a classic case of a slipping clutch. On older model cars this can be solved by a simple clutch adjustment. On late model cars, because of the design, it may require a clutch replacement. Symptom: When releasing the clutch pedal, the car vibrates. 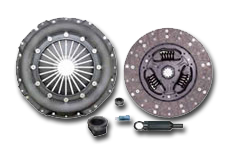 Cause: A bad pressure plate or warped flywheel, both of which are indications of the need for a clutch replacement. Symptom: The gears are stiff, and shifting is difficult. Cause: This might be indicative of a bad clutch. 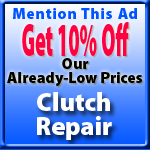 However, I have found that the majority of the time a clutch adjustment or clutch hydraulic repair will solve this problem – which is less expensive than replacing the whole clutch. A good diagnosis of the clutch components will pinpoint this problem. Symptom: The car will not go into gear at all. Cause: As this can be indicative of a clutch linkage or hydraulic problem, this could be simply solved by a clutch adjustment or hydraulic repair. Symptom: The transmission grinds in some gears. Cause: While it is possible this is a clutch problem, it may actually be a problem with the transmission. This will be checked, and if transmission replacement is required I can offer a number of options. Whether you are bringing your car to NorAm Auto Repair Services for an alternator repair or brake repair, your clutch will be inspected for free!